TROY — Troy Police Department arrested a Troy woman for felony drug trafficking during a traffic stop in the area of South Short Street and Race Street on Tuesday. Ashley E. Alexander, 34, was charged with first degree felony trafficking to prepare drugs. She was arraigned on the charge in Miami County Municipal Court. Her bond was set at $100,000. 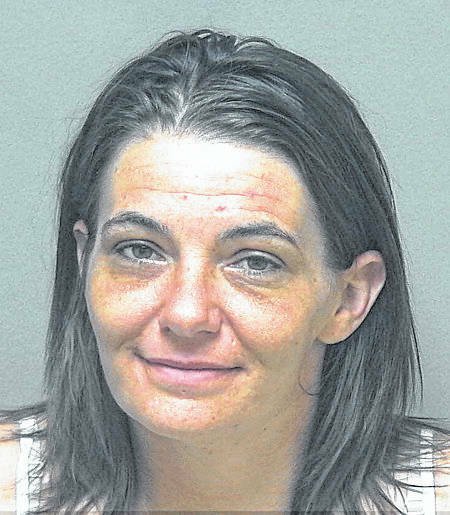 She remains incarcerated in Miami County Jail. An officer on patrol noticed a 2008 Nissan Maxima with illegal tint driving in the area of Race and Short streets and stopped the vehicle on Drury Lane. The officer later requested a K-9 unit and Tipp City Police Department responded. The K-9 alerted on the vehicle and detectives conducted a search of the car. A padlocked safe was located on the passenger floor of the vehicle as well as unused syringes throughout the car. According to the report, Capt. Jeff Kunkleman obtained permission from Alexander to open the safe. A set of scales, more than an ounce of methamphetamine, MDMA (a synthetic recreational drug), and other items to prepare the drugs for sale were located. The driver stated he was helping Alexander move and the items were hers. The driver, Michael Binion, was cited for the window tint violation and driving under suspension for failure to pay child support and released.